Bookride: The Golden Treasury of Caroline and her Friends. Pierre Probst. The Golden Treasury of Caroline and her Friends. Pierre Probst. Pierre Probst. THE GOLDEN TREASURY OF CAROLINE AND HER FRIENDS. Golden Press,USA, 1961. VALUE? A whole lot of punters for this book. No copies on web which either means they are darn scarce or just sell whenever they appear and nobody has put a greedy enough price to stop it, so let's say $450 for a nice one. An indifferent copy of the UK first (Hamlyn 1963) was recently a buy it now on ebay at $475 and the seller claims it has made $1000 there, but could be deluded or having a laugh. Does anyone know the significance of a blue bound version of The Golden Treasury of Caroline and her Friends? Seems to be original, not rebound, but could be. I'm not an expert or collector, just like this book. Any info you have is appreciated. My sister has the blue bound version from childhood. I recently tried to find one, discovered how scarce they are, and so clued her in on the value of her Caroline. She is going to let me look at hers when I see her in a few weeks. Ohhh, I so loved this book as a child and read it to my own children, but it has been destroyed. I only have a few pages remaining! My favorite story was the one where they went to India. Our family has an incomplete copy and I plan on digitally copying it this year to preserve it. We're missing a few key pages. Why doesn't Golden Books re-issue it? I wrote them last year and asked. No reply. Figures. I am astonished to see that one of my favorite books from childhood is so valuable. I got it through one of those book order programs they had in Elementary School. I have read it to my nieces, now in their 30's and now to my own children, and I love reading it to this day. My copy is in excellent condition. I feel very lucky! I wish they would reprint it in English. It would be a great hit. Also my most favorite book from childhood. The hours I spent first looking and then reading that book and pretending I was Caroline! Kept the book for my children, and my daughter loved it too. Somewhere in the last 20 years the book disappeared, maybe I will find it hiding in the attic one day. I almost fell on the floor last year when I saw in on ebay for $700.00. I have a copy of Caroline and her Friends the blue bound edition (UK). It was my favourite book as a child. Not sure why I decided to look it up on the internet. I am pruning a lot of books. just found a copy was given to my wife around 1965! caroline and her friends; anyone interested? rclear666 - I am also interested in your book. Please may I ask someone to help me to restore the last – I think 6 pages? The book – the story named Winter sports -ends at the page 143 where I can see ½ of a picture – Caroline and her friends in the night, searching for Bobby. And at the previous page the story ends with the sentence: „ And since Bobby was so light, it carried him all the way down the mountain and in to the tiny village that nestled in the valley below.“ And that is all. Last pages are missing. Please, If you are also owner of that book, may I ask you to be so kind and copy for met the last pages and send them by e-mail? I t would be nice, If I can bind the cpmpleted book and pass it to my three years old daughter. On the other hand I know that nowdayas nobody has enaugh time and I will understand if you do not have time for this. I have no idea where my mother got this book from. I just remember reading it over and over. I was in early elementary school and I am 47now. I have read this book to all of my kids. The spine is being held together with gray masking tape, but I will not throw it away.It is a great story. I have a copy of "The Golden Treasury of Caroline and her Friends", as well as "Caroline in Europe". Both have all pages. Anyone interested?Isadore59@aol.com; Louise. i am interested louise in your copies of caroline. are they both in english? I would like to purchase this, is it still for sale? I have a copy on eBay at the moment! Already at £100 and three days to go! Will report back on the final price. I really loved this book and didn't realise I still had it! Found it on the loft after a major clear out! I have just come across a copy of this book. Copyright 1961, white cover. I am planning on listing it on eBay, but not certain of it's value in today's market. I am not a bookseller, just deal in mostly vintage items so do not know how to rate this book, but I would say it is in good to very good condition. Any ideas information or help would be appreciated. There is a nice 1961 copy of this book available on an eBay auction for $350. 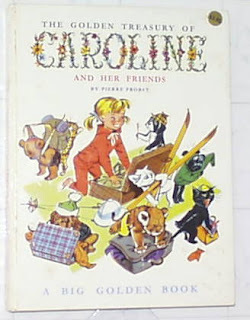 Hi - There is a wonderful BOOK on CD of Caroline And Her Friends - USA 1961 version available on Ebay for under $20. Just do an Ebay search for the book title, it should come up!! LOVE IT!! I just found my copy of Caroline and her Friends. white cover, golden treasury. I'm so glad I still have it. the binding is missing but covers okay, but no intentions to sell!